America on a beer bottle budget #1 | We've got the bug! Beer: it has come a long way over the years, thanks to a few clever buggers and advances in brewing technology. We now have an exciting culture of craft brewing popping up all around the world. Over the next few months throughout America I hope to find lots of little craft breweries and taste some of the great beers this country has to offer. Beer fact: Americans consume on average 50 billion pints per year! It seems nowadays that craft beer has become a trend, and this allows brewers to be adventurous and think outside the square. This is starting to show in some of the unique beers that are on offer today – a huge change from where it all began around 7000 years ago! So we started our pub crawl in Southampton, Long Island, and it wasn’t long before we found our first pub – the Southampton Publick House. This is a place that shows it has had frequent use for many years, but they offer friendly service, great burgers, and in-house brewed beer on tap. Their range of beers varies over the different seasons, but you won’t be disappointed with the great tasting beers on offer. They’ll even pour you free tasters and explain which beer best suits your taste. A personal favourite was the Biere de Mars, quite hoppy but overall a nice easy-drinking lager. Friday nights are busy with the after-work crowd but the atmosphere makes for a good time. Definitely worth popping in! Our next stop was a small beach town east of Southampton at the tip of Long Island, called Montauk (see our previous post about Montauk here). We packed our bikes into the train and 30 minutes later we arrived. Having our bikes was a huge asset, and allowed us to see more of the town than we would have on foot. 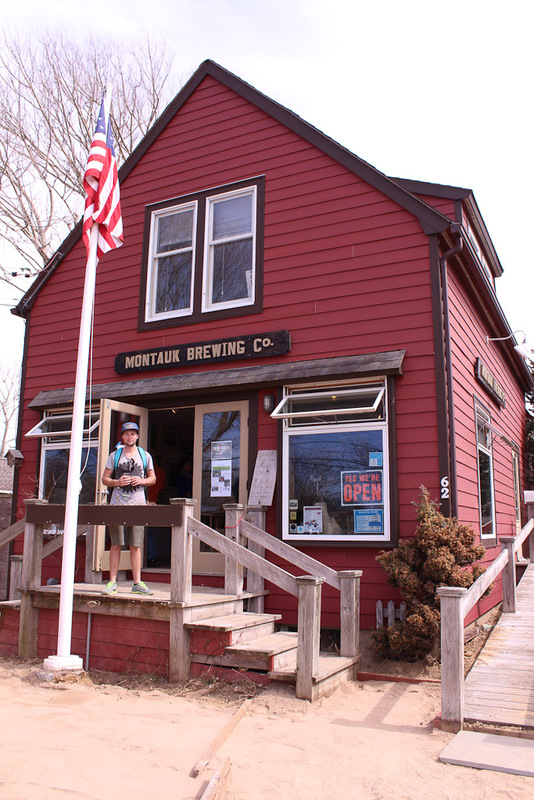 We stopped off at a great little place called the Montauk Brewing Company for some well-deserved beer after a hot ride. Beware – this little place seems to be a local haunt on Sunday afternoons making it quite busy, but you cant go to wrong if a place is busy! This reasonably new brew house was established in 2010 by three friends with a dream of taking their home brewing hobby to a bigger crowd than their backyard BBQs. For $10 you get a small branded beer glass to keep and a taste of all their beers they have on offer. Great value and a nice way to finish off a Sunday, or any day for that matter! They have seven beers on offer – while most of these are seasonal, their two mainstream beers are called Driftwood Ale and Offland IPA. These are two great beers and will only get better as their brewing days go on. So if you find yourself out around Montauk drop in and see what the guys are up to. More on beer coming soon. Southampton Publick House is excellent!